As confirmed by the author, Crossroads is a seven-volume series that will be divided into three parts—two trilogies and an interlocking standalone novel—so the new book “Shadow Gate” is essentially the middle volume in the first trilogy. As a result, readers can expect a few middle volume tendencies such as many events either being set up for or left unresolved until the next chapter “Traitor’s Gate”. At the same time however, the book also works as a standalone novel—as long as you’ve read the first one—and a companion piece to “Spirit Gate”, particularly because of the way the book is set up. You see, like its predecessor, the narrative in “Shadow Gate” is not followed chronologically and often jumps around. In fact, out of the novel’s seven ‘Parts’, two are actually flashbacks that answers many questions from “Spirit Gate” like where did Cornflower come from, who she is, how she became a slave and so on, and which act as a bridge between the two books. Readers will also discover more about the Guardians, including their abilities—riding winged horses, immortality, walking the 101 altars, possessing a third eye and a second heart to know a man’s darkest secrets, a staff of judgment, et cetera—learning who eight of the Nine are, and which Guardians have been corrupted. Of the other storylines we have the pregnant Mai, her husband Captain Anji, and his fellow Qin who are trying to adjust to the strange customs of the Hundredfolk while settling down, which means finding themselves wives. Joss meanwhile, has become the Marshal of Argent Hall and is trying to strengthen the reeve halls and reestablish assizes courts following the events of the last book. Finally, two scouting parties have been sent off, one to the north to discover what kind of enemy the Hundred is facing, and another to the south where Emperor Farazadihosh of the Sirniakan Empire remains a threat to Captain Anji and his people. In short, there are several events happening at once in “Shadow Gate”—not to mention the number of additional subplots—so the story can get complicated real fast if you’re not paying attention, especially with the time shifts, but for those readers who are able to follow along and piece together how everything is connected, the book can be incredibly rewarding. 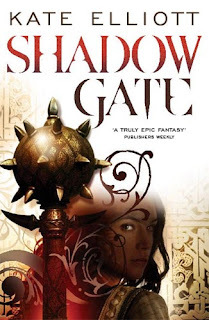 Now if you’re not familiar with the author’s work, it’s important to note that Kate places great emphasis on worldbuilding and characterization, both of which are featured prominently in the Crossroads series and thus, “Shadow Gate”. Of the former, the Hundred is an interesting place where slavery is not just accepted, but a large part of their society. The Hundredfolk also worship seven different gods, are policed by reeves—and Guardians at one point—and measure time by a complex system that seems influenced by the Chinese calendar since people are born in the year of some animal like Snake, Wolf or Ox. Where things really start to get interesting though is when different cultures clash like the Asian-influenced Qin who are distrusted because of their ‘slanted eyes’ or the blue-eyed, white-haired tribespeople who are viewed by the Hundred as demons and vice versa. 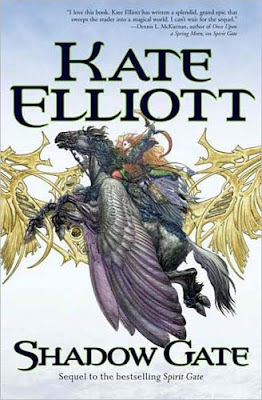 Obviously there’s much more to the world than what I’ve already mentioned, and much more yet to come, but basically if you’re a fan of detailed worldbuilding and crave something a little different from traditional fantasy settings, then the Crossroads series is highly recommended. Of the latter, “Shadow Gate”, like the first book in the series, features a huge cast of characters with the novel narrated by several different third-person POVs including returnees Joss, the former debt slave Keshad, Captain Anji’s wife Mai, and her older brother Shai while new perspectives consist of an envoy of Ilu, the pretty young woman Avisha, and Nallo, an ill-tempered widow chosen to become a reeve. Also, there are several supporting roles that are important to the story like Keshad’s sister Zubaidit, Captain Anji of course, Cornflower, the reeve Volias and a few surprises, namely characters from the first book who seemed insignificant then, but become essential components in “Shadow Gate”. And that’s really the beauty of Kate’s characters, not just their diversity—personalities range from drunken womanizers to noble outlanders and strong females—or how they evolve in unexpected ways, but how every single individual in the book, no matter how irrelevant they may seem, are integral to the novel. Of course, with such a large cast there are a few problems that arise like how unbalanced the narratives are—sometimes a character will disappear for a couple of hundred pages—or the occasional lapses where it’s difficult to tell who is actually speaking or thinking, but compared to Kate’s overall performance, these are minor complaints.